We all dream of cruising down the highway in a new racer. However, for many, that isn’t financially possible. Well, thanks to the 2017 Chevy Camaro’s price tag, this dream can actually be a reality! It’s unlikely that customers will have the opportunity to acquire a powerful engine for an affordable price. Furthermore, it’s unlikely that these individuals will have the chance to choose between four available offerings. However, that’s the case with the 2017 Chevy Camaro, as this surprisingly affordable vehicle can be equipped with one of four muscular engine options. The “smallest” of the bunch is the 2.0-liter Turbo engine, which manages to crank out a spectacular 275 horsepower and 295 pounds-feet of torque. These numbers predictably influence performance, as the specs play a role in the car’s 5.4-second zero-to-60 mph time. Meanwhile, thanks to the additions of fuel-saving technologies like Direct Injection and Variable Valve Timing, customers can also anticipate a 31-mile-per-gallon highway fuel efficiency. Next on the list is the 3.6-liter V6 engine, which elevates those power specs to 335 horsepower and 284 pounds-feet of torque (resulting in a startling 5.1-second zero-to-60 mph time). The 6.2-liter LT1 V8 takes those specs to another level at 455 horsepower and 455 pounds-feet of torque (resulting in a 4.0-second zero-to-60 time). Finally, for the utmost power, customers can opt for the 6.2-liter LT4 V8 engine, which delivers an insane 650 horsepower and 650 pounds-feet of torque (leading to an eye-popping 3.5-second zero-to-60 mph time). Drivers surely don’t want to find themselves in an accident with their recently-purchased car, and they surely don’t want any of their occupants to suffer injuries. 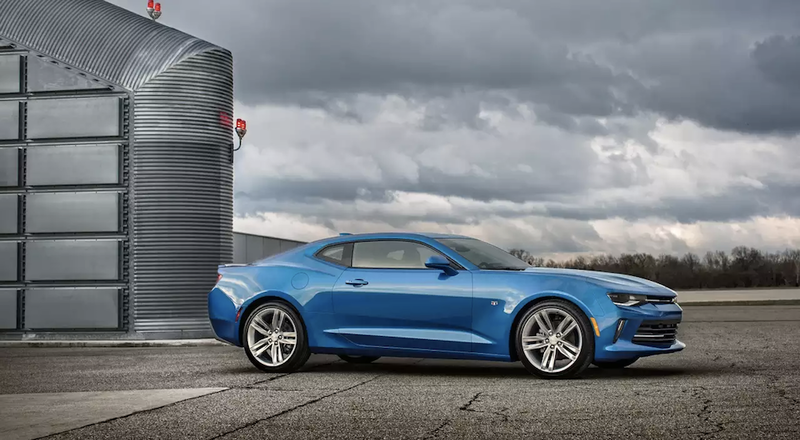 Fortunately, that shouldn’t be a concern in the 2018 Chevy Camaro, as engineers included a number of useful safety functions. These inclusions will play a significant role in helping drivers avoid accidents altogether. The StabiliTrak Electronic Stability Control System is an especially important inclusion, as the unit will help keep the driver on their intended path. When control or handling is compromised by poor road conditions, this unit will kick into high gear and provide the ultimate traction and support. The brand’s assortment of additional safety amenities, including Lane Change Alert (with Side Blind Zone Alert), and Rear Cross Traffic Alert will also help drivers avoid accidents when traveling at high speeds. Even the rear vision camera and accompanying Rear Park Assist are appreciated inclusions, as these features will help cut down on fender benders. If a driver does encounter a collision, they can comfortably rely on the Camaro’s construction to keep them safe. The eight standard air bags (including the innovative driver and front passenger knee air bags) will provide all of the necessary cushion, helping drivers avoid injuries. Meanwhile, the brand’s ultra-high-strength steel safety cage won’t compromise during a collision, thus keeping occupants secure. If help is needed, drivers can rely on the OnStar Automatic Crash Response System. The operator will be connected to an OnStar Advisor, who can subsequently send emergency personnel to the crash location. You’re presumably pursuing a 2017 Chevy Camaro because of its incredible performance capabilities. However, customers certainly won’t scoff at the array of technological features included in this racer. The obvious star of the interior is the brand’s MyLink system, which provides drivers with a host of applications via the seven- or eight-inch diagonal touch-screen unit. If drivers prefer, they can connect their smartphone via the Apple CarPlay or Android Auto compatibility, allowing them to listen to their favorite playlists or perform many of their phone’s basic functions (including calls and texts). Drivers will even have the opportunity to opt for the vast SiriusXM Satellite Radio catalogue, allowing them to listen to hundreds of different stations. If you are going to listen to your favorite tunes, you’ll certainly appreciate the Bose premium audio system, which provides an unmatched listening experience. That’s not all the Chevy Camaro offers in regards to technology. The vehicle includes a wireless phone charging station, meaning drivers don’t have to finagle with wires as they’re looking to charge their gadgets. The eight-inch diagonal center screen (which is cleverly placed right in the driver’s line of vision) provides essential information like vehicle diagnostics and fuel efficiency. The Keyless Open and Start capabilities provide unmatched convenience, as do the power seats with memory (allowing drivers to consistently find their ideal seating position). Finally, the heated steering wheel is for those seeking an extra bit of comfort, as the unit will allow drivers to avoid those cold winter mornings. Those living in the Albany, New York area shouldn’t look any further than DePaula Chevrolet as they’re shopping around for a 2017 Camaro. After all, the dealership provides customers with everything they’d want and need during the buying experience: a number of useful services, a vast inventory, and convenient hours. DePaula wants to work with the customers throughout every step of the car-owning experience, so your relationship with the dealership doesn’t have to end once you’ve driven off the lot. Rather, you can continue to rely on the business to help serve all of your Chevy needs. Before you even make a purchase, the dealership’s finance department will help you determine a fair and logical payment plan. Many businesses aren’t willing to provide any type of financing to those with poor credit, but DePaula is focused on giving all customers an opportunity to purchase a new car. Meanwhile, their helpful service department can fix up any issue you may run into. Alternatively, you can rely on the expert technicians, who specialize in working on Chevys, to handle all of your basic maintenance. Instead of relying on that mysterious, over-priced mechanic, head into DePaula for all of your mechanical needs. The 2017 Chevy Camaro is a logical choice, but we wouldn’t blame you if you wanted to explore alternatives, especially since you won’t be required to visit another dealership in order to do. That’s because DePaula is currently housing an incredible 600 new cars on their lot, providing you with an abundance of brands and models. If your budget is a bit tight, you can still capitalize on this vast inventory, as DePaula also has more than 200 used and certified pre-owned cars sitting on their lot. The car-buying process is hectic, and you’ll surely want to wrap up the experience as quickly as possible. Thanks to DePaula’s flexible hours, that is more than possible. The sales department is open from Monday through Saturday at 8:30 am, meaning you won’t even have to miss work in order to visit their facility. Meanwhile, the service department opens at 7:00 am, so you can quickly have you car serviced before you even embark on your commute.